In apartamentoschimenea.com we have three apartments situated in “Apartamentos Chimenea”, a group of 32 apartments with a communal swimming pool opened in 2010. It is located in a exceptional place, only 400 meters from the Burriana beach, close to shops, cafés and restaurants. 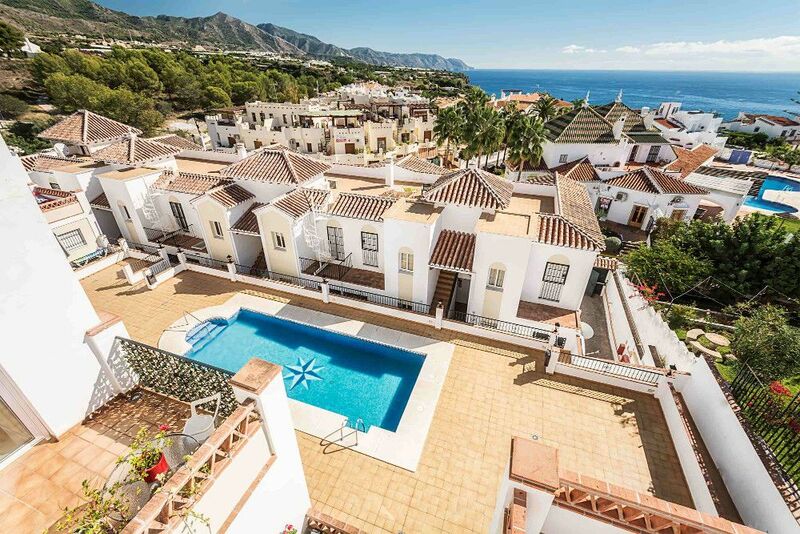 Moreover, it is one of the best residential areas in Nerja, where you will be able to relax completely. 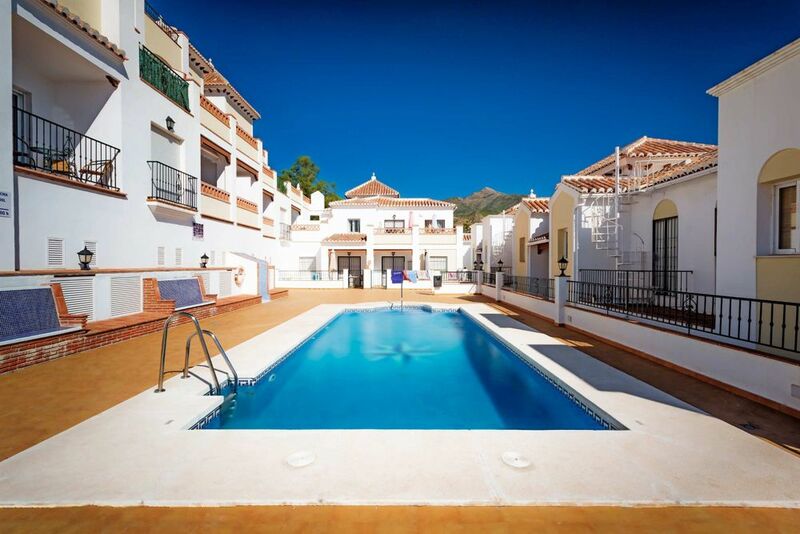 Holiday accommodation at the Best Price Guaranteed.”Apartamentos Chimenea” are located in the beautiful town of Nerja at the Costa del Sol, near Malaga Airport (65 km from the property). The famous Burriana beach is 400 meters away. Balcony of Europe is situated on a rocky promontory, 2,5 km away from “Chimenea” Apartments. Minimum length of stay 7 days, except availability of fewer days. Cancellation/Prepayment Cancellation and prepayment policies vary according to apartment type. The fee allows the charge of 30% of the total amount at any time after booking and the rest of the payment (70%) is due at check-in. The fine print Please inform Apartamentos Chimenea in advance of your expected arrival time and your flight number. You can use our contact form or directly with our accommodation. The cave of Nerja is located close to Maro, a few kilometres from the town of Nerja. The cave was re-discovered in modern times on 12 January 1959 by five friends, who entered through a narrow sinkhole known as “La Mina”. The cave has several sections open to the public, a fantastic day out for the whole family. It is located on a rocky promontory, at the end of a palm tree avenue. It has several cannons, due to it was once a fortress designed to keep out pirates. 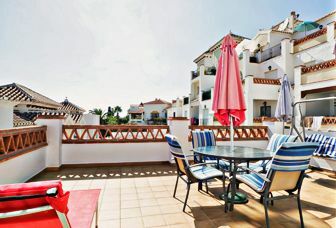 Its panoramic views make this balcony the most popular place in Nerja. It is a great family walk. Comfortable trainers are a requirement. It is best walked from May to September. The amount of water flowing will vary depending on the time of year. Located in the Natural Park “Acantilados de Maro-Cerro Gordo” (Natural Area: Maro-Cerro Gordo Cliffs). Length: 400m, Width: 15m. Occupation: low. Beach of Nerja with promenade. Length: 800m, Width: 40m. Occupation: high. Facilities: beach bars, lifeguard (summer), beach showers, kiosks, play areas, disabled access, parking, pedalos. Length: 120m, Width: 20m. Occupation: high. Facilities: lifeguard (summer), beach showers, kiosk, sun beds. Length: 200m, Width: 20m. Occupation: high. Length: 300m, Width: 40m. Occupation: high. Facilities: lifeguard (summer), beach showers, kiosks, sun beds. Facilities: beach bars, lifeguard (summer), beach showers, kiosks, parking. Copyright © 2017 apartamentoschimenea.com - All rights reserved.